The Governor of California is the highest executive authority in the California state government, whose responsibilities include making annual "State of the State" addresses to the California State Legislature, submitting the budget, and ensuring that state laws are enforced. The position was created in 1849, before California became a state. The current governor is Arnold Schwarzenegger, a Republican, who was elected on October 7, 2003 to complete recalled Democratic Governor Gray Davis' term, and reelected on November 7, 2006, defeating California State Treasurer Phil Angelides of the Democratic Party. His current term will expire on January 3, 2011. The Executive Budget - The governor has the final responsibility for preparing and submitting to the legislature an annual budget containing most of anticipated state income and expenditures. The final budget requires a two-thirds approval of the legislature. The Veto - The governor has the option to veto a bill within 12 days after being received from the California State Legislature. The Legislature can override a veto by a two-thirds majority vote in both the Assembly and the Senate. The governor may exercise a line-item veto, rejecting individual items in any appropriations bill. Recommending Legislation - The governor may not formally introduce legislation, however many proposals for legislative action emanate from the governor's office. The political influence of the governor dictates the probability of success or failure of the governor's agenda. Calling Special Sessions - The governor may convene the legislature "on extra ordinary occasions" to consider only subjects specified in the governor's proclamation. In practice, this power is used frequently, usually in concert with normal sessions. The purpose is to force the legislature to address the governor's legislative program. Appointing State Officers - Although several of the positions of the executive branch of California are directly elected, the governor appoints most of the top administrative officers to the various departments and boards that govern California. Additionally, unexpired terms of certain elected officials, including U.S. senators, state executive officers and judges of the state court. Power as Political Leader - The governor by virtue of the office becomes the de facto leader of his or her party. Furthermore, because of California's immense size, the governor is often spoken of as a potential presidential candidate. Commander in Chief of the State Militia - The governor may activate the California State Militia at any time to complement local law enforcement. While this may be done at the governors discretion, it most often comes by request of a local law official. The California National Guard may also be called upon, subject to Presidential approval. Executive Clemency - Except for convictions during impeachment, the governor may grant pardons, reprieves and commutations of sentences to individuals convicted of any felony. Role in Higher Education - The governor also has full membership and voting powers to the Regents of the University of California, the governing board of the University of California system, along with other elected officials. A majority of members on the Regents of the University of California are appointed by the governor. Similarly, the governor has full membership and voting rights on the Board of Trustees of the California State University, and appoints a majority of its members. The governor also appoints all of the members of the Board of Governors of the California Community College System. Governors are elected by popular ballot and serve terms of four years, with a term limit of two terms, if served after November 6, 1990. Governors take office on the first Monday after January 1 after their election. Petitions signed by California voters equal in number to 12% of the last vote for the office of governor (with signatures from each of 5 counties equal in number to 1% of the last vote for governor in the county) can launch a gubernatorial recall election. The voters can then vote on whether or not to recall the incumbent governor, and on the same ballot, they can vote a potential replacement. If a majority of the voters in the election vote to recall the governor, then the person who gains a plurality of the votes in the replacement race will become governor. The 2003 California recall began with a petition drive that successfully forced sitting Democratic Governor Gray Davis into a special recall election. It marked the first time in California's history that a governor faced a recall election. 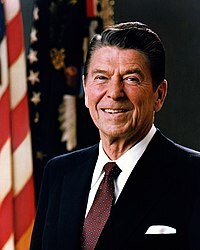 He was subsequently voted out of office, becoming just the second governor in U.S. history to be recalled. He was replaced by Republican Arnold Schwarzenegger. The Lieutenant Governor of California is elected at the same election, but not jointly as the running mate of the gubernatorial candidate. California has had a governor and a lieutenant governor of different parties 23 of the past 28 years (as of 2006), as has been the case since 2003 with Governor Arnold Schwarzenegger (Republican) and Lieutenant Governor John Garamendi (Democrat) and former Lieutenant Governor Cruz Bustamante (Democrat), from 1991-1999 with Governor Peter B. Wilson (Republican) and Lieutenant Governor Gray Davis (Democrat), from 1983-1991 with Governor George Deukmejian (Republican) and Lieutenant Governor Leo T. McCarthy (Democrat), and from 1979-1983 with Governor Jerry Brown (Democrat) and Lieutenant Governor Mike Curb (Republican). This occasionally becomes significant, as the California Constitution provides that all the powers of the governor fall to the lieutenant governor whenever the governor is not in the State of California, with the lieutenant governor often signing or vetoing legislation, or making political appointments, whenever the governor leaves the state. The lieutenant governor is also the president of the California State Senate. In practice, there is a gentlemen's agreement for the Lieutenant Governor not to perform more than perfunctory duties while the Governor is away from the state. This agreement was violated when Mike Curb was in office, as he signed several executive orders at odds with the Brown administration when Brown was out of the state. Court rulings have upheld the lieutenant governor's right to perform the duties and assume all of the prerogatives of governor while the governor is out of the state. Between the births of John Bigler in 1805 and Arnold Schwarzenegger in 1947, California Governors have been born in every decade except the 1880s. Between the deaths of John McDougall in 1866 and Ronald Reagan in 2004, Governors have died in every decade except two: the 1910s and the 1980s. Excluding Governors who died in office, Robert Waterman had the shortest post-governorship. He died on April 12, 1881, a mere 3 months and 4 days after the expiration of his term. Sworn in at the age of 30, J. Neely Johnson was the youngest Governor. Sworn in at the age of 69, Frank Merriam was the oldest Governor. Both governors who died in office, Washington Bartlett in 1887 and James Rolph in 1934, were the Mayor of San Francisco immediately before becoming governor. Former Vice President Richard Nixon was the Republican nominee for Governor of California in 1962, and lost to Democrat Pat Brown. Nixon later was elected president in 1968 and reelected in 1972. (Republican, 1969-1974).